Gapers Block - To be Demolished: 515 W. Oak St. Permit Description: Wreck and remove 3 story brick mixed use building. 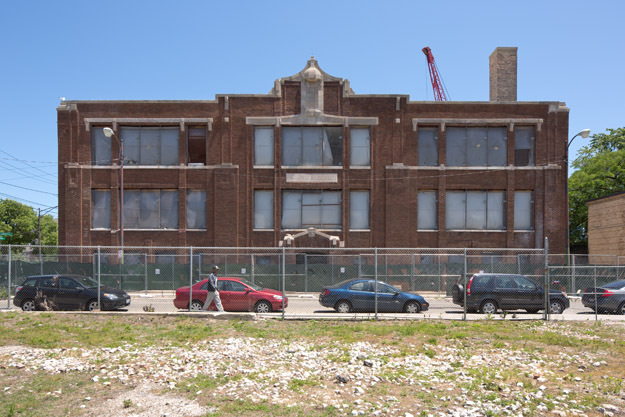 This former church was long the site of social services for the Chicago Housing Authority, as evidenced by 30 contracts for the Near North Ministry Alliance and Chicago Fellowship of Friends and the Department of Human Services between 1997 and 2009. Services included "youth development services," "community policing enhancement," and, fittingly, "housing abandonment/consulting." This former church is about 30,000 sq feet - Directly across from the new "Parkside of Old Town" development. Location would make for a great development opportunity, zoning B2-3 permits up to 29 units. The building could also be rehabbed into many different commercial or residential uses. Blocks from downtown Michigan Ave shopping district Recent $150k price reduction - make an offer! One proposal for the site shows new residential development. In the prospectus, there is a section entitled "The History of the Near North Side." Six sentences cover the entire 70 year history of public housing in the area. One 311 service request for the building being "vacant and open" occured on February 15, 2011.